New Publication: Working Together for Resilience: Linkages between School-Based Disaster Risk Management and Community-Based Disaster Risk Management. This study by David Selby and Fumiyo Kagawa is a product of the continuing and close collaborative partnership between HOPE’87, Pakistan, and Sustainability Frontiers on disaster risk management in the education sector. Specifically, it arises from a 2015 to 2016 ‘Tools and Materials for School Based Disaster Risk Management (SBDRM)’ consultancy for HOPE’87 in Khyber Pakhtunkhwa Province in which CARE International Pakistan was also a partner. For details of the consultancy click here. In its 121 pages, the study first draws on international literature as it offers a rationale for locating disaster risk management in communities and lays out key features of community-based disaster risk management (CBRDM). It next trains its focus on the structures, mechanisms and functioning of community-based disaster risk management in Pakistan. The study then turns to look at school-based disaster risk management (SBDRM) as an element of comprehensive school safety before identifying its key features. In the next chapter practical means of interlinking CBDRM and SBDRM are first addressed. The child as change agent in community-based disaster risk management with a potentially key role in coalescing school and community responses to risk is also considered. The next chapter enumerates concrete, practical ways in which deeper integration of CBDRM/SBDRM can be effected by, inter alia, establishing cross-representation on respective disaster risk management committees, opening two-way informational flows between community and school disaster management bodies, establishing joint planning mechanisms and processes, giving the community an active role in school-based disaster risk management, instituting overlapping school and community disaster risk management capacity building, making the school the hub and laboratory of whole community disaster risk management and maximising the contribution youth and children can make to both CBDRM and SBDRM. The second half of the document opens by laying out six models for implementing initiatives designed to interlink and integrate CBDRM and SBDRM. The models arise in part from semi-structured interviews conducted by HOPE’87 and CARE officers with key KP stakeholders on behalf of the SF team (who designed the surveys and analysed the survey results). 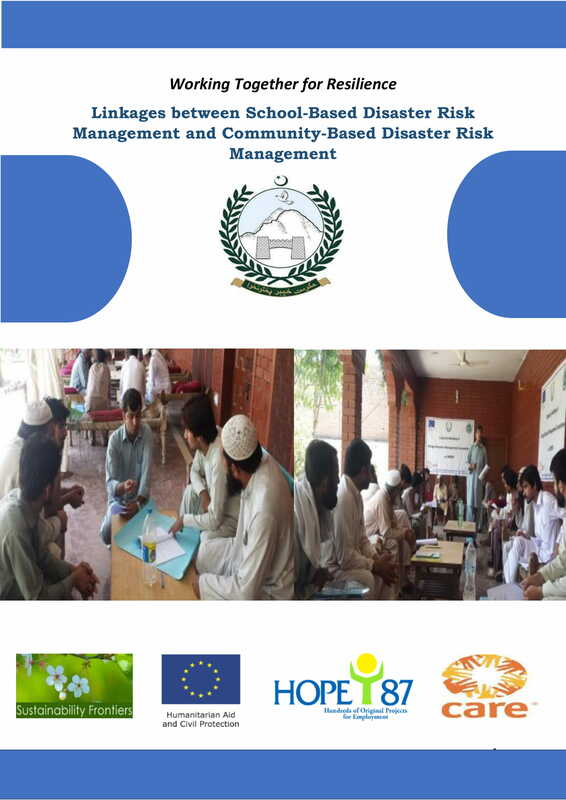 The first three models concern developing combined CBDRM/SBDRM in just one locality and are tailored according to the respective levels of capacity and functionality obtaining within both the village and school disaster risk management committees. The fourth offers a model for CBDRM/SBDRM integration across a cluster of schools and localities working in tandem. The fifth looks at forms of communication, coordination and support that could be put in place between villages and schools on the one hand and district level authorities on the other. The sixth looks at vertical communication, coordination and support linking province, locality, district and province. Descriptions of the six models include practical step-by-step implementation guidance. The publication ends with an account and analysis of the implementation of the three local-based models in four village locations in Khyber Pakhtunkhwa Province. For the publication, click here. For the HOPE’87 website (which also carries the publication) click here.